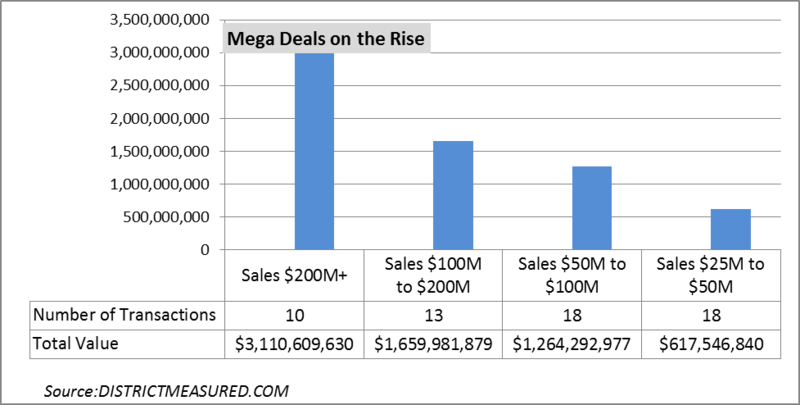 The return of mega deals in DC’s and the nation’s commercial real estate market. Not only are prices for residential properties in the District reaching new heights but sales of commercial properties (office, hotel and apartments) are also booming in the District. This is part of a larger national trend that reflects strong investor appetite for U.S. commercial properties. Fueling demand for commercial properties is the healthy state of the U.S. economy and the consistent pace of employment gains over the past years. These employment gains have helped to drive down vacancy rates and put upward pressure on rents. With vacancy rates approaching equilibrium levels in many markets, rent spikes are likely on the horizon, music to the ears of investors. In addition to strong internal fundamentals, the bright outlook for the U.S. economy and real estate markets makes returns on dollar denominated assets look particularly attractive to global investors vis-a-vis returns on assets in other countries. An example of this strong global demand was the recent purchase by Chinese investors of the Waldorf Astoria Hotel in Manhattan for almost $2.0 billion dollars, one of the three transactions totaling more than $1 billion in the past year. While Manhattan remains the largest market in terms of volume and commands the highest price per square foot, the DC commercial market has also seen a sharp rise in mega deals where sales prices for properties exceed $200 million. The ten largest mega transactions, with sales prices exceeding $200 million, accounted for over $3.1 billion of sales activity, almost half of the total value for all large commercial transactions. Among these transactions was the sale of 800 17th St. NW. This transaction set a record price of over $1000 per square foot, pushing DC office prices closer to the $1300 per square foot on average paid in Manhattan. Just below this threshold there were 13 transactions with sales prices exceeding $100 million, which contributed to over $1.6 billion dollars in sales volume. What exactly is the data? DC sales data are from the DC Recorder of Deeds. NYC data was provided by the New York City Department of Finance. < Previous Are you related to someone named Michael or Mary?